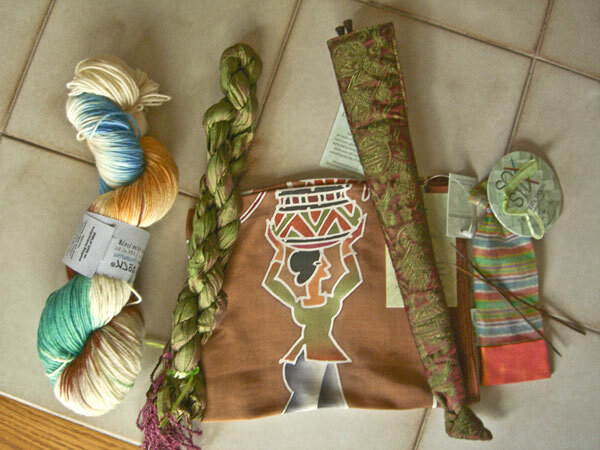 A week ago last Saturday, I taught a sock class at a LYS, came home and went to bed. And there I stayed for several days, fighting off some chesty, 102F fever, cold thing. Last week my world contracted to include only necessary tasks: Feeding the fur kids, drinking lots of liquids, teleconferences I could not avoid or delegate, and as much sleep as I could get between bouts of coughing. I left the house only once, and only because I had completely scraped the bottom of the cat-food barrel, the kids had not had breakfast, it was now dinner time and three pairs of eyes were glaring at me accusingly. There is only one place on the entire metro-area west-side where the only food that Kidd can (and will) eat is available. I crawled over there, figuratively speaking, and crawled home. The fur kids were pleased. I went back to bed. Then one of those bizarre flash heat-waves that we in Portland just love hit. I was actually sort of glad because the heat has been fairly effectively baking the ick out. The first picture shows my garden sizzling under 100F (that’s like 38C or so). Note that I am standing in the shade of the grape arbor. It was almost tolerable in the shade. In the sun, it was very, very hot. A mere 24 hours later, this was the scene. We’re having a summer thunderstorm. I am standing under the grape arbor in an effort to stay fairly dry. 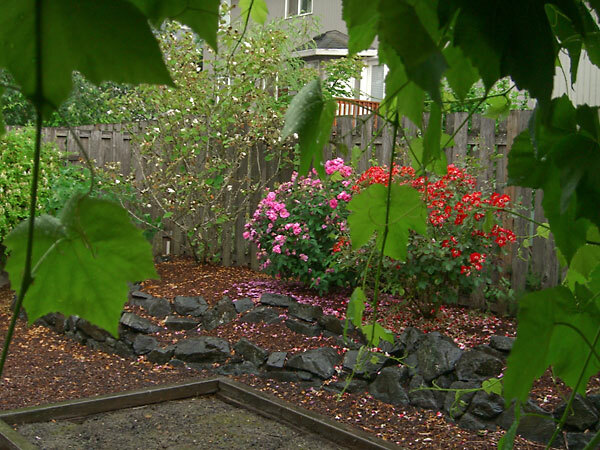 The rain, not content with flooding the street out front, has been having fun knocking the petals off the roses. You know what happens when you pull a hot frying pan off the stove and put it directly under a running faucet? Sizzle. Steam. Sizzle. That’s about what it feels like now. But I did feel a cool breeze through the window just a bit ago. And the air smells so after-rain good. I think the rain came because I watered my lawn this morning. Not that there’s really any connection there, you know. But… it’s odd how often that happens. Just saying. But that’s not what I wanted to chat with you about today, gentle reader. A while back I was one of a group of people in a workshop. At one point, the moderator asked us all to close our eyes and try not to think of anything until time was called. So I closed my eyes and dutifully attempted to clear my mind and waited and waited and waited until finally I heard time. We all agreed that the wait had seemed lengthy. Now close your eyes again, the moderator said. But this time I want you to prioritize 5 things that you need to do when you leave here. I made it through about 3 or 4 things when I heard time. I couldn’t believe that we’d been given such a short period to do this task, when the previous period had been so long. Well… it turned out that both had been exactly 10 seconds. You can try this yourself, gentle reader. You will need someone to help you with timing. But it’s worth trying. Go ahead. I’ll wait right here. Back? Isn’t it amazing? The point of the whole exercise was that time may seem very different to one who has nothing to do but wait for another, in contrast to how time seems to the one who is frantically trying to get something for the one who’s waiting. Time really is relative. Or, as Einstein said, Put your hand on a hot stove for a minute, and it seems like an hour. Sit with a pretty girl for an hour, and it seems like a minute. That’s relativity. This week, when my focus was narrowed by illness, time hung heavy through the long nights. At one point I remember thinking, why aren’t the days this long when I feel good enough to do something besides lie here and cough my lungs out? And the answer, of course, is because then I have a bazillion things that have to be done right now and I can barely keep the list of the top 5 prioritized in my brain, let alone actually take care of them. For years I’ve had an internal dialog with myself about how I’ll have lots of time, just as soon as some future event happens: #1 Son learns how to drive so I don’t have to cart him around. This project ends. #1 Son moves out. I get past the holidays. Of course, it never happens. I never get caught up. When one task ends – be it obligation or recreation – another two or three arise to take its place. And most of them are things I like to do, and so time just flies. I’m afraid I will have to either pare my life down to nothing or only do things I don’t like so it feels like they take longer. Neither choice seems palatable. How do you deal with all of the forty-seven-million things that are demanding your attention? I haven’t gotten very far with this pair yet because I just don’t seem to have half the knitting time that I think I should. This work thing seriously cuts into my knitting and social life. Seriously. It’s a pity that it seems to be so necessary, eh? 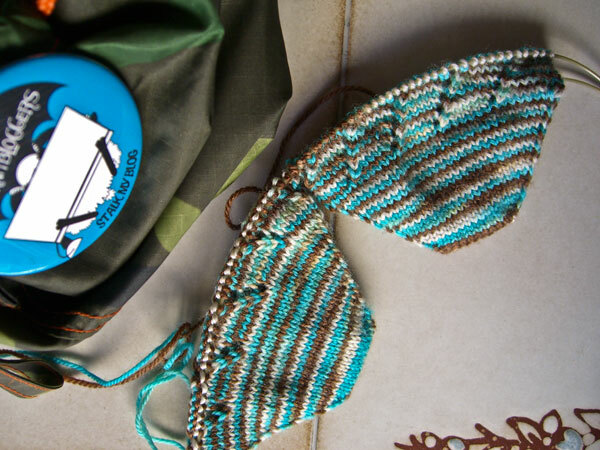 This is Stitchjones Supersock in Andes Mints. Yum! This is a smooshy soft 100% superwash merino yarn that’s a joy to knit with. The color is a bit off in this picture. What looks blue-ish is really a lovely minty green. Be sure to go look at the other great colorways – color goes to 11, oh yes it does! Go on, and look. I’ll wait right here. Stitchjones is available locally at Twisted and All About Yarn, or you can buy directly from her Etsy shop. I’m lucky enough to knit with the lovely Stitchjones proprietress, which is really convenient but rather hard on my pocketbook, if ya know what I mean. 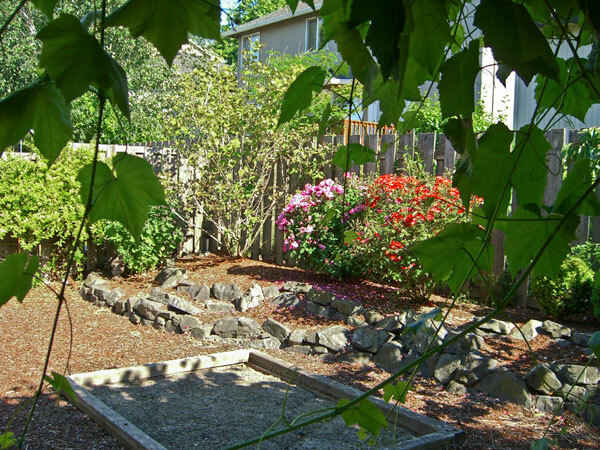 Since I don’t have a lot of knitting pictures, I will distract treat you to some pictures of my garden. The roses weren’t in bloom for Rose Festival this year because our spring has been so lousy, but they’re at the peak right now. This is Jude The Obscure. 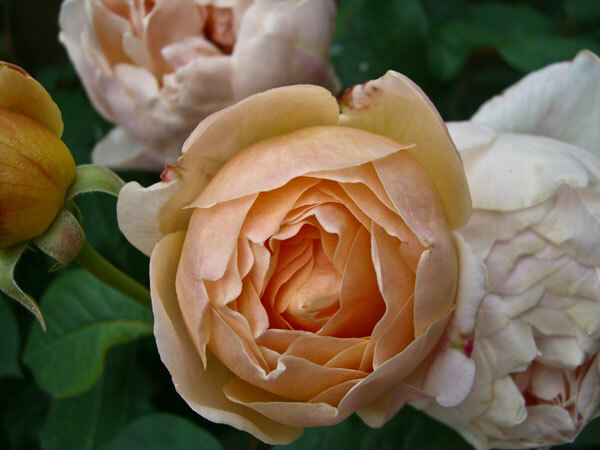 I wish that I could somehow hook up a virtual scratch-n-sniff so you could smell this rose. It’s amazing. The aroma drifts in through my open doors and windows, and my whole house smells of Jude. This is Eyepaint. My camera struggles a lot with this red, even when taking pictures on an overcast day, as this was. But it really is bright! I love looking out and seeing all of the red and white flowers dancing in the breezes. The reverse of the petals is white, so they look like they’re blinking. Thus the name, I suppose. #1 Son called from Germany, and again last night from Barcelona. They are apparently doing very well with this tour and he’s having the time of his life. 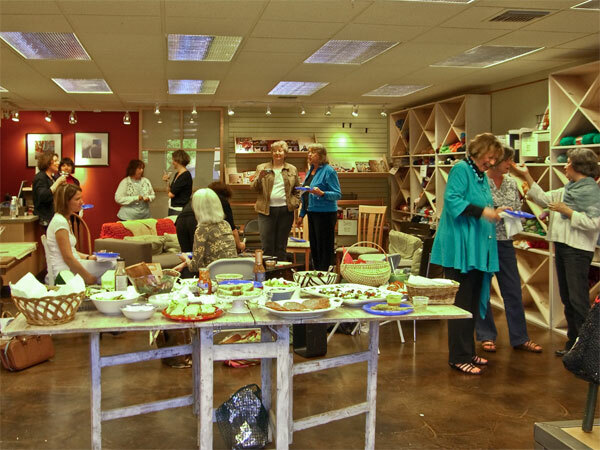 Last Thursday the usual suspects held a little goodbye party for Tangle Knitting Studio. It was a chance to laugh and cry and reminisce. And there may have been adult beverages involved. (Did you know, gentle reader, that there’s such a thing as blueberry vodka? And it’s not, actually, blue? Whodda thunk it.) And there was plenty of food, too. We’re not just a bunch of lushes. I feel like I have lost something that can’t be replaced. But I know that Thursday Night Knitting will continue, in some way, in some place. I probably won’t be able to buy yarn at the same time, but the important thing is that I will still be able to see my knitbuds on a semi-regular basis. I’ll just have to plan to come with plenty of yarn. It can be done. It’s not like I don’t have an extra project or two on the needles. #1 Son (on the phone): Hi, Mom. I have just a bit of running round still to do. I should be there really soon. #1 Son (on the phone): Hi, Mom. It’s taking me longer than I thought. A lot longer. I’ll be there as soon as I can. It’s probably going to be late, though. Mom: It’s already kinda late. #1 Son: I know. Sorry. I’ll be there as soon as I can. Lots of stuff to do. I’m leaving for Europe tomorrow! #1 Son arrives home. He still has stuff to do, mostly involving my computer and printer. The Truck has usurped the place in front of my house again, so he parked in my driveway, but way over to the side so I might be able to squeeze out past it (I park in the garage). #1 Son is ready to leave. We hop into my car. I back out carefully, avoiding his car, and we’re off. His phone rings constantly. In between brief, monosyllabic phone conversations, he give me driving directions. Don’t go that way. Turn left here. Take the freeway north, then east. #1 Son: I left my guitar and the bass in my car. We have to go back. [2:10] – we arrive at the bass player’s house (I have to think of a good name for him, suggestions welcome). I wait in the car while #1 Son and Bass Player have a long conversation including many gestures and pointing at a sheet of paper that has something #1 Son has written on it. #1 Son: Get on the freeway. #1 Son: But it’s faster! We’ll have to go through downtown if you go this way! Mom: It’s 2:30 in the morning. I’m incredibly tired. I don’t want to drive on the freeway. It won’t take that much longer. #1 Son: It’s really late. I’ll probably just stay up all night ’cause I can sleep on the plane tomorrow. Mom (wishing she had a plane to sleep on tomorrow): I love you. Have a wonderful time. Be safe. Come home safe. #1 Son: I will, Mom. I love you! I know that you folks back east are having a heat wave. Here in Portland: not so much. Yesterday it was almost 70 with sunshine. But today we’ll be lucky if it makes 60 and it’s definitely not sunny. It’s still wool sock weather here. 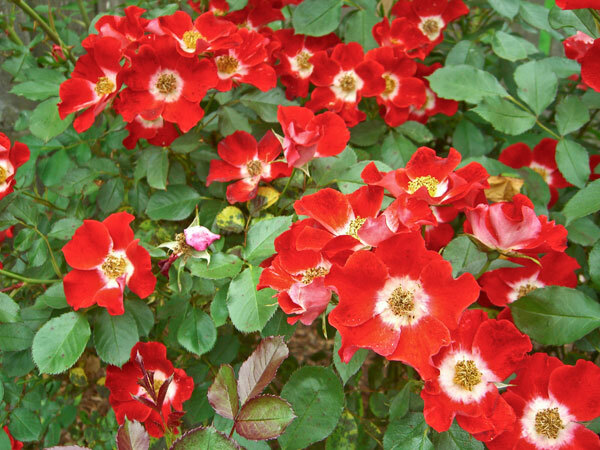 It’s been Rose Festival season, and that means rain and cold. Since it’s Rose Festival, though, I though it only right to pose these socks with roses. The only one I had in bloom when these pictures were taken was Eyepaint, and it’s the perfect color. This is the first pair of Monkey’s that I’ve knit – I know, I was a little slow to hop on the Monkey bandwagon. I loved wearing them on Friday, and I can see these becoming one of my favorite pairs (thus the heel stitch on the bottom of the heel). I love the way that this colorway knit up in the Monkey pattern. The white stripe is very subtle, until it gets up to the cuff where it becomes wider and more bold. Of course, there’s a sploosh of white during the heel turn. On one sock the sploosh is under the heel, and on the other it’s on top of the instep. I don’t mind that STR pools around the instep. 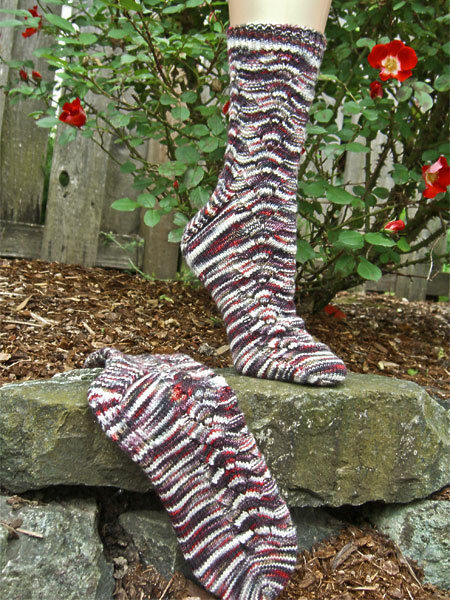 I could have knit these with a short-row heel if it had really bothered me. 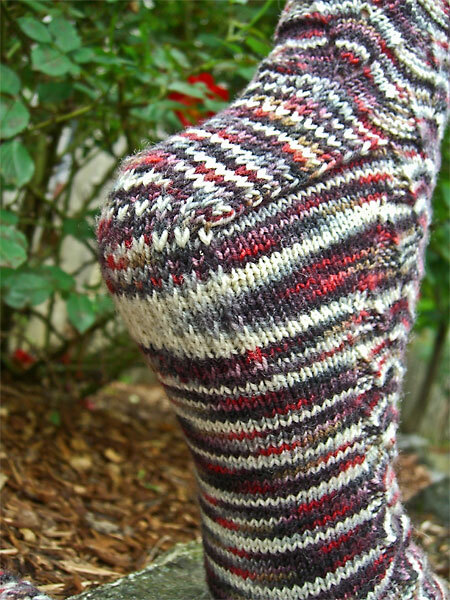 Knit toe-up, two at a time, using Judy’s Magic Cast-On. Heel stitch under heel and on heel flap. As soon as these socks were finished, I immediately cast on a new pair of socks with Stitchjones yarn in Andes Mint. You can get your own over at her Etsy shop. I’m not sure what the new pair of socks are going to look like yet, but I’m not worried. The yarn will tell me what it wants to be. Lantern Moon sources their wonderful products mostly from southeast Asia. They believe in being economically and environmentally responsible. They pay fair wages and help to provide training and safe working conditions while encouraging local artisans to continue the centuries-old hand crafts that are quickly disappearing. At Twisted, the Lantern Moon folks showed a very interesting slide show of their trips to Vietnam and some of the artists (I can call them nothing less) who create the beautiful products that Lantern Moon sells. Twisted had a full range of Lantern Moon products available, and it was all on sale. So I think I showed admirable restraint. From right to left… A set of US #0 Sock Sticks in ebony. Yes, I do use these every now and then. Really. 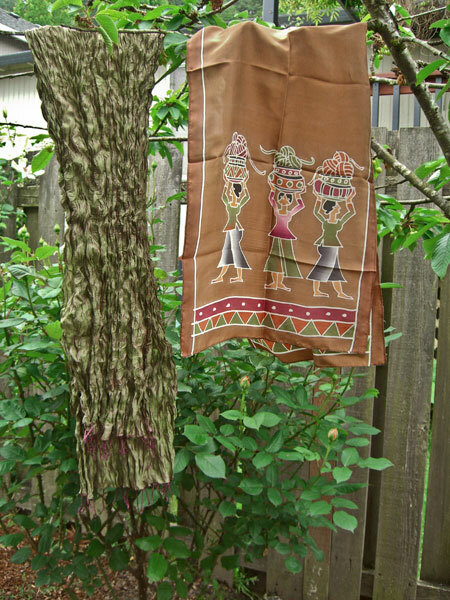 Two silk scarves – one that was hand batiked with this delightful picture of women carrying baskets, and a twisted scarf from Cambodia. In this picture, I’ve untwisted the beautiful Cambodian scarf. Yes, it really is those shades of green and dark berry, shifting together as the fabric moves. I have no idea how the weaver gets that effect. But it’s so cool and beautiful. In local news, I will be teaching a couple of sock classes this summer at All About Yarn. This is a four-week, toes-up, two-at-a-time class. If you are interested, please contact the shop.